In the last two decades alone, there has been an estimated three million conservatories installed across the UK – an outstanding achievement for the industry – but could we do any better? Mark Hanson, marketing manager at Ultraframe looks at why, given that the industry has slowed down over the last few years due to the recession, it is important that both retailers and manufacturers pause to take stock to consider how they can improve for mutual benefit to make the most out of 2012. Perhaps unsurprisingly, the behaviour and buying patterns of consumers has changed as a result of the recession and at the same time demand for conservatories is still ‘soft’ due to the continued harsh economic conditions. To ensure retailers stay ahead of the game and meet the wants and needs of consumers, they must work with their conservatory system partner and invest both time and money into making sure that they have a comprehensive marketing plan in place, including an up-to-date suite of marketing tools and support in place. The conservatory industry is a highly competitive market and so a well thought-out and strategic marketing plan is crucial for retailers looking to stay ahead of the game. Regular up-to-date marketing communications with prospect customers will help ensure that a retailer is front of mind when consumers are looking to make a purchase. As the UK’s leading manufacturer of conservatory roof solutions, Ultraframe makes a significant annual investment to ensure that its marketing campaign and support for retailers is second to none. From industry leading brochures and overprints, right through to bespoke promotional items, Ultraframe has an in-house team of marketing and design specialists that can help to create the complete tailored marketing solution for each of its customers. As well as having an extensive photo library, Ultraframe has product samples and ancillary products available, either for use by sales teams or for showroom support materials. While it is essential that retailers service their existing customer base, there is also massive potential in 2012 for those retailers who are willing to expand their reach into new products and solutions, satisfying the more sophisticated demands of today’s consumer. 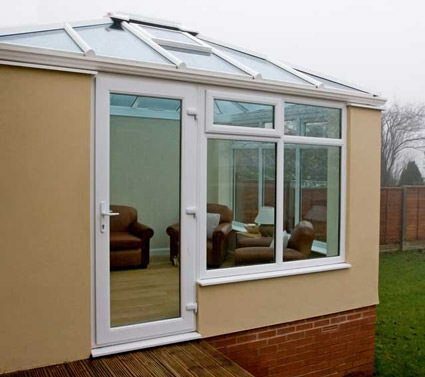 As well as being able to engage a wider range of new customers, retailers will also be able to offer existing customers even more selection when looking to install a conservatory. Having successfully repositioned its brand from being a specialist conservatory roof manufacturer to a company that offers a much wider portfolio of home improvement products, everything from composite doors and windows, roof lights, bi fold doors and, through to contemporary glazed extensions and orangeries, 2012 is set to be a big year for Ultraframe. The company has always been known as the leading manufacturer of conservatory roofs, and as such, needed to mark its transition into this new arena. Wanting to be recognised as an innovative provider of light and space solutions, the company created a revised logo and strap line ‘transforming light and space’ which reflects this move and demonstrated the company’s commitment to becoming the number one provider into this market sector. With well over 500 million people currently engaged in social media activity globally and if you add in web site usage too, the ways in which we communicate on a personal and professional level has changed beyond recognition. Most consumers use the web in some way during the buying process which means retailers must have an up-to-date, interactive and engaging online resource . Covering everything from product innovations and company news, through to special features such as an up-to-date blog and image library, websites should grab the attention of consumers but also provide them with punchy information, to aid the purchasing decision. To help its trade customers stay ahead, Ultraframe continuously updates its website to ensure that it continues to offer both potential and existing customers practical details and advice, as well as everything that they could ever need to know about designing and installing home improvement products which transform light and space around the home. The company’s very own TV channel, Ultraframe TV, is regularly updated with company news as well as video interviews with customers and industry stakeholders, providing an additional online resource for its customers. Further enhancing the company’s online presence, customers can now follow Ultraframe on Twitter. It has never been more important for both retailers and manufacturers to work hard to energise the existing market for conservatories, as well as explore and open up new opportunities and markets by introducing cross-over and other home improvement products. Ultraframe believes that 2012 is set to be a great period and it will be looking to extend its suite of industry-leading technology even further, increasing the range as well as adding enhancements that will improve the feeling of quality and individuality that comes when installing an Ultraframe product.